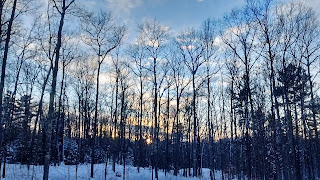 The last bit of rare solstice sunlight glimmered through barren trunks and across unmarked snowdrifts as I clipped into my skis. A few puffs of clouds caught the rays and turned them pink against a gold and lavender sky. The highest boughs of a white pine grove glowed warmly despite the chill, and I glowed warmly, too, as I kicked up the first steep hill. As the sinuous trail swooped through glacial hills and mature forest, my stride became a joyful rhythm. Skiing in the late afternoon generally means I have the trail to myself, which is a lovely side-effect of my schedule. The woods aren’t completely quiet, though, especially to the ears of a naturalist. Hairy woodpeckers and chickadees occasionally give their cheerful calls. Mouse and squirrel tracks speak another language. But my most reliable companions lately have been the ravens. Their bold calls cut easily through the snowy trees, shush of skis, and the dampening warmth of earmuffs. In the wild, ravens mimic other birds and nature sounds. I once encountered a raven that sounded just like dripping water. Since it was near zero that day, the sound of liquid water was quite out of place, but also a beautiful foreshadowing of spring. Perhaps another reason the ravens’ calls are less grating than crows’ is that they are more often heard alone or in pairs. While crows often congregate in family groups, winter roosting flocks, and floater flocks of juveniles, ravens are more solitary. A mated pair of ravens will defend their territory together year-round and often travel in twos. This is what I’ve been encountering along the trails. On a twelve kilometer loop, though, I typically hear ravens three distinct times. Are they three pairs on three territories? Or do I wind back through the same territory twice? Or, are they following me? Ravens do associate with humans to find food, and aren’t above a good rummage through your garbage. They also know to associate gunshots (but not other loud noises like car doors) with hunters and fresh meat. For the same reason, ravens follow wolves as the packs travel, rest, and hunt. They are too smart to follow me. A raven pair who finds themselves with a bonanza of roadkill in their territory better watch out, though. Once young ravens discover the feast, they bring in reinforcements. In one study, groups of at least nine immature ravens were more likely to overcome the defenses of a territorial pair and gain access to a carcass. Sometimes on a windless day I’m able to hear the ravens even when they’re not calling. Unlike owls, who need silent flight to hunt for mice, the diet of ravens doesn’t require stealth. Ravens are mainly scavengers, and carrion makes up a big part of their diet. Their wings, then, like the wings of turkey vultures, must be built for soaring in order to discover those carcasses. Both ravens and vultures have distinct silhouettes with “fingery,” slotted wings resulting from the tips of their primary feathers being widely spread. The slots in between the feathers are narrow passages through which air flows more quickly, like water through a chute. This minimizes wind resistance, reduces drag by a significant amount, and increases lift. While wing slotting is characteristic of birds who soar over land, upland game birds like grouse also use wing slotting for their explosive take-offs. It’s a good way for birds with short, rounded, maneuverable wings to also increase lift. In contrast, birds who soar over the ocean and don’t need maneuverability have long, narrow wings with no slotting. Maneuverability is key for ravens, and they don’t just use it to avoid trees. Many people have witnessed ravens doing acrobatic rolls, somersaults, and even flying upside down for more than a half-mile. This playful behavior has also earned ravens a reputation as tricksters in many cultures. On the solstice, this darkest day of the year, it also seems appropriate that many stories credit Raven with bringing back the sun. In 2011, local artist Jan Wise painted a series of raven images for the Museum to illustrate a selection of her favorite raven myths. One story from the Original Peoples of the Pacific Northwest ends: “He unfurled his great wings, and took the light back to the people on the other side of the sky.” Maybe these Northwoods ravens will also use their great, black wings to help bring back our light. Besides being bigger and having nicer voices than crows, ravens also have bigger beaks, a tuft of feathers at their throat, and wedge-shaped tails. 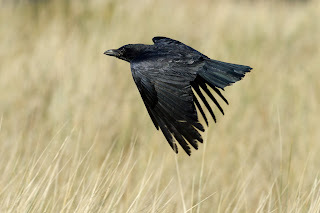 Ravens also flap less and soar more while flying. 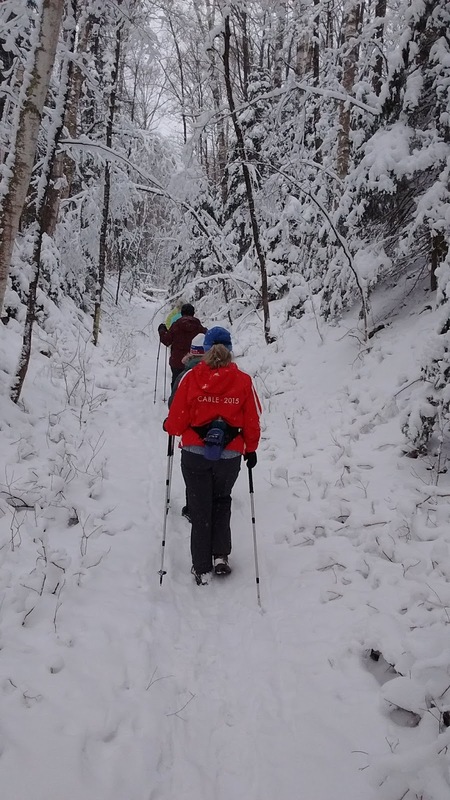 Thick snow crunched and squished underfoot, soft snow plopped down from bent branches, and giggles echoed through the forest as a group of friends hiked through the winter woods. I reveled in the beauty of the landscape transformed by winter. 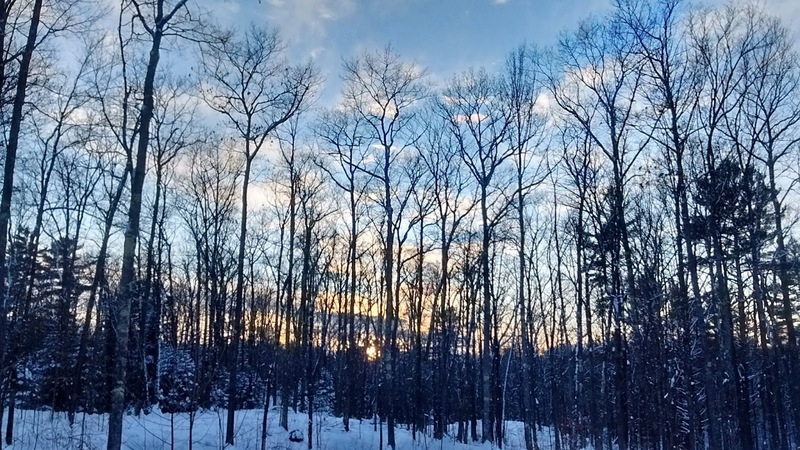 Spindly sapling trees—ones that we’d look right past in the summer—were sculpted into graceful arches by the heavy snow and formed countless cathedral doorways in the woods. In a meditation on humility, flexible fir trees calmly let their branches droop under the piles of fluffy frosting. A quick tap from a hiking pole would send a shower of snow down onto the trail, and the bent tree would spring upward just enough for us to pass underneath. I was at the front of the line when I heard my name called. “Oh Emily…we need you!” I turned to look. “What is this tree with the beautifully ridged bark?” It’s such a nice feeling to be needed for my naturalist skills. With my eyes I followed the trunk upward into the forest canopy. Stout, sturdy twigs showed up against the bright gray clouds. Like an army of literal stick figures, each twig sported pairs of smaller twig “arms” raised to the sky. “It’s an ash tree.” I called back, finding satisfaction in the ease with which I could give the answer. I love winter. The lack of ticks and mosquitoes, the cooler temperatures, the soft caress of freshly groomed tracks beneath my skis, the cozy warmth of my favorite puffy coat and the instant calm inside its hood drawn against the wind. The smell of wood smoke, and the camaraderie between those in our smaller, tougher community, all provide comfort in this challenging season. As a naturalist, I also feel a sort of comfort in the simplicity of the bare twigs on trees and shrubs, uncluttered by fluttering leaves or ephemeral flower stems. 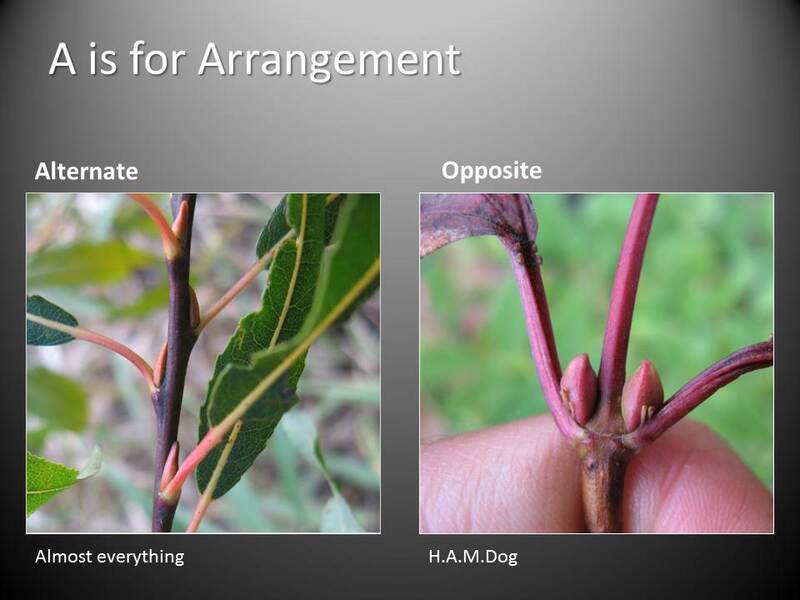 My first formal botany class was focused on learning 85 species of woody plants by their buds and winter twigs, and I’m still most confident in identifying trees and shrubs by their twigs and bark instead of their leaves. Leaves can change shape from the bottom of the tree to the top, from sun to shade, and many different species have maddeningly similar shapes. Twigs, however, are much more consistent. If you know which patterns and characters to look for, discerning the identity of a twig is only a matter of looking closely. 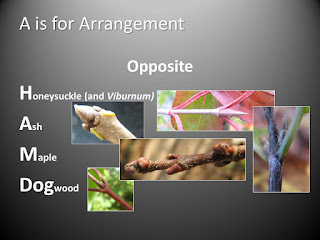 I enjoy teaching others to see those patterns too, and I’ve found my enthusiasm to be contagious during a slide show I call “The ABC’s of Winter Tree ID.” The “A,” the place we start, is Arrangement: the arrangement of leaves and twigs (or the buds that will become them,) along a stem. Most woody plants have alternately arranged leaves. This means that just one leaf can be found attached at any given point along a stem, and the leaves usually alternate sides. In contrast, many conifer trees have several twigs that diverge from a particular node. This whorled arrangement gives fir trees their distinctive layered look, especially when young. The ash tree I identified on the hike exhibited opposite arrangement. Two leaves or two twigs are attached at the same node on opposite sides of the stem. When identifying trees and shrubs in the Northwoods, finding an oppositely arranged species is useful because it narrows down your choices quickly. Of the trees, maples and ashes are the only opposite ones. 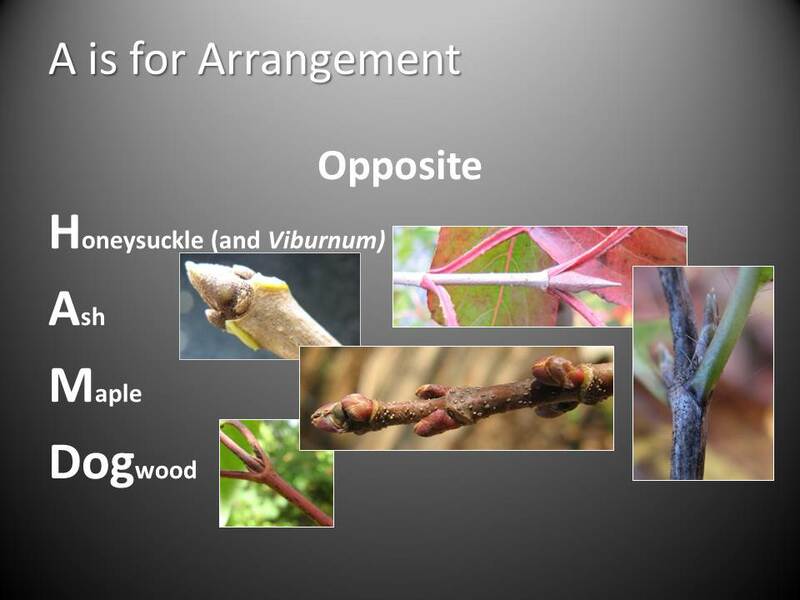 When you include shrubs, you find dogwood, honeysuckle, and viburnum also follow that pattern. Or so I thought until my friend sent me an email with the subject “mystery plant.” The attached photo showed a straight, slender twig, with a smattering of little white lenticels in the reddish bark, and alternate, reddish buds flattened against the stem. Each bud had three rounded bud scales with lighter edging, and was subtended by a U-shaped leaf scar with three bundle scars from where veins had once carried water to the leaf petiole. It didn’t fit any of the identification keys in my head. It didn’t fit any species in the technical botany manual. With a few more questions I discovered that my friend had found it growing in a swampy area, and that its bark peeled in big vertical strips. All the characters lit up the part of my brain that said “silver maple;” all except for the alternate arrangement. Maples should be opposite! Try as I might, though, I couldn’t find another name that worked. As it turns out, it was a twig from a silver maple. Specifically, it was a fast-growing shoot that had popped out of the base of the trunk of a mature tree. I showed the photo to another botanist, and she said that she sees it occasionally. The occurrence of buds along a twig is determined by the presence or absence of the growth hormone auxin. Perhaps this twig was growing so fast that the messages became jumbled. It’s not common, but also not unheard of. Nature has a way of asserting its independence. The rules we formulate about it are purely descriptive and useful only to us humans as we try to understand the world. Even with that uncertainty, the lacy patterns of twigs twisting through a winter sunset are no less beautiful. “We rise early and the business of the day gets underway while darkness still prevails. This morning the moon is the finest paring of a silver fingernail in a deep azure sky and in the east no light yet heralds the coming day. “The kitchen light sheds a glow upon the snow outside and silhouettes the cottontail that, crouched beneath the bird feeder, gleans the fallen seeds. It seems to feel no fear at being thus on stage. Perhaps the prominent brown eye stretches a little wider and the ears are more alert, but the chewing does not cease nor do the busy paws that dig in rapid spurts to release seeds frozen in the snow. The grosbeaks had been thankfully messy yesterday and crumbs from their table were manna to the hungry animal. “At length, the food ran out, the rabbit was surfeited or it seemed expedient to go. But first a rapid washing of the face, paws flicking quickly over ears and whiskers and tongue touching up shoulders and chest. Then off in purposeful hops as though to reach a destination before the break of dawn. While a winter morning might start by watching animals find food at the bird feeder, a winter afternoon is perfect for searching out some food of your own. Lois was an excellent hunter, trapper, and angler. Here she writes about the joys of ice fishing. “Given the proper conditions, a day of ice fishing can produce some delightful fringe benefits, completely aside from the fish one may catch. Let it be, preferably, a sunny day and mild enough so the fishing holes do not freeze over too rapidly and, for my purposes, let those holes be in a lake with weeds. “Looking into the water is like glimpsing a mirrored reflection of summer when insect life abounds. Some of this is in larval form and especially apparent are the nymphs of mayflies swimming actively about in the cold water. Other larvae may be those of whirligig beetles, caddisflies or the large fierce-looking dragonfly larvae clinging to weed stems. “These weed stems are also often occupied by the strange, long-legged insects called water scorpions, often two-and-one-half inches long and rather resembling water-logged walking sticks. A giant water bug may swim by or a water boatman or backswimmer, as well as countless weaving, jerking, scooting, unnamed miniatures. Active and comfortable in the world beneath the ice, they quickly stiffen and become immobile if lifted out of the water. “The air above the ice holds life of other styles and, for most people, probably more appealing. A blue winter sky is a perfect background for the tumbling, joyful antics of a pair of ravens. Looping, rolling, diving, together and apart, they are the soul of carefree pleasure and the coarse “wauk, wauk” of their cries expresses complete approval of the warm trend in the weather. Crows, more businesslike, and purposeful, wing their way swiftly from shore to shore, their sharp cawing a pleasant sound in the quiet of winter. “A swirl of pine siskins sweeps overhead like wind-driven leaves, their sweet twitterings as ephemeral as mist. In dry weeds along the shore, snow buntings feed, and farther back, among the trees, woodpeckers hammer and call above the notes of nuthatches and chickadees. If it is a lucky day, the eagle will soar above adjacent open water, his gleaming head and tail seeming whiter than the underlying snow as they catch the rays of the winter sun. For the past year I’ve been sharing Lois’s writings with you once a month in order to celebrate the Museum’s 50th birthday year. That year is coming to a close, but hopefully, like Lois, you also are able to live each day with the joy that comes from observing and appreciating nature. The tunnel of shady conifers felt bitterly cold as I huffed uphill on my fat bike. Our wide tires crackled and popped over brittle leaf litter, sticks, and ice columns pushing up through the once-damp soil. Sunshine beckoned up ahead, though, and as I burst into the open field at the top of the hill I could feel the rays warming my legs right through thick tights. We’d hoped to participate in a post-Thanksgiving “Pie Burner” group fat bike ride in a neighboring town, but icy conditions there deterred us. Instead, we’d come to Tioga Pit, a reclaimed iron mine near Cohasset, MN. From 1955 to 1961, the Tioga No. 2 mine shipped more than 3 million tons of iron ore. That 3-million-ton hole is now a deep blue fishing lake. Rolling hills surrounding the pit have grown back into a mix of conifer forests, scraggly young hardwoods, and brushy fields punctuated with spindles of aspen and birch. While the forests weren’t particularly beautiful, they were interesting. 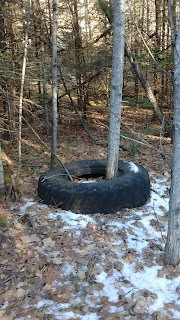 Along one old roadbed, a series of half a dozen big old truck tires reminded us of this area’s industrial past. 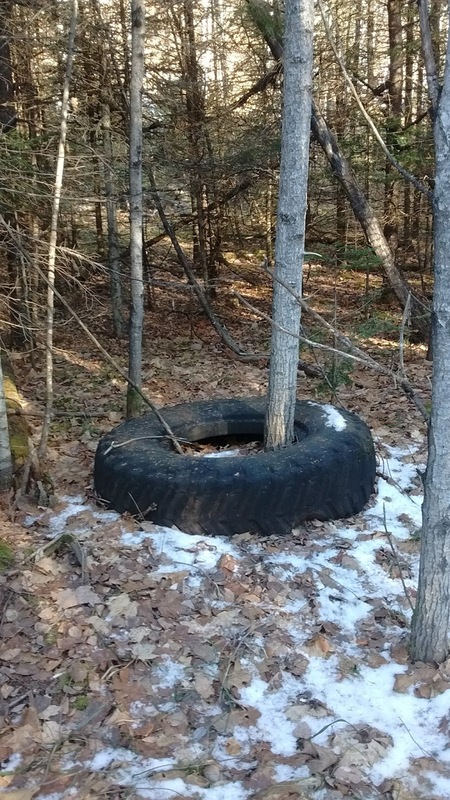 In a reversed game of giant ring-toss, the smooth trunk of a living hardwood tree grew up through the center of almost every tire. Back home, I was hoping Google could help me figure out what I’d seen. 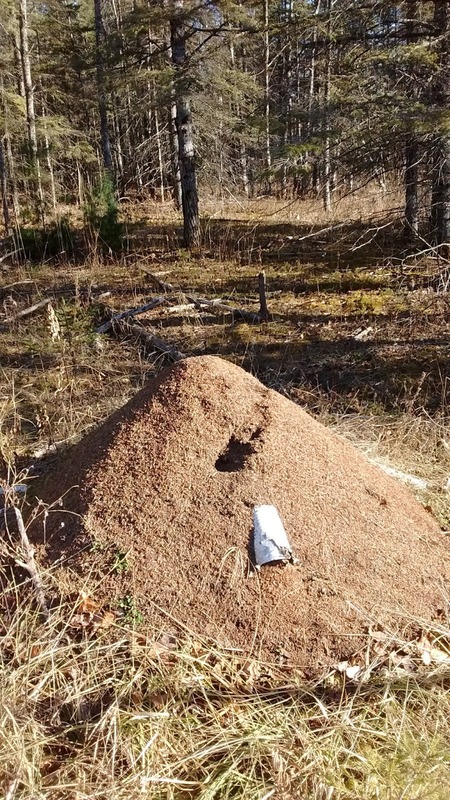 My search for “giant ant hills in Minnesota” quickly turned up a discussion thread with some good leads. 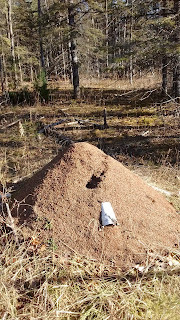 I narrowed my suspects down to two species in the genus Formica. No, they are not related to Formica® Laminate Countertops. The word “formic” comes from the Latin word for ant. 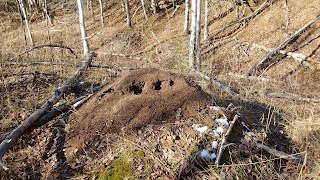 Formic acid, the ants’ chemical defense system, also derives its name from ants. Formica is the largest genus in North American and contains almost one-sixth of all Nearctic species of ants. 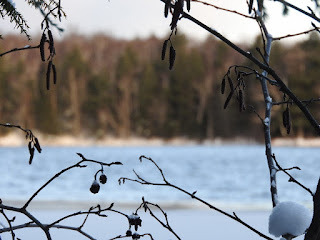 November was giving a big gray sigh of frustration as the sky tried to decide if it would rain or snow, and the lakes hemmed and hawed about the proper schedule for freeze up. There was beauty in its hesitation, though. The shimmering sheet of ice reflected the pale gray sky on its gossamer, crystalline fibers. The pale edge of the ice contrasted with the silky blackness of open water, which mirrored the lacy skeletons of shoreline trees. Although eager to get home before dark, the scene pulled me to a stop. In any season—but especially the shoulder ones—moments of a certain beauty are ephemeral and must be appreciated promptly or not at all. As I was pondering that, the glassy surface of the open water--where I had been admiring the faithfully reflected trees--was cut open by a V-shaped furrow. What was marring this delicate surface? I tracked the V as it sliced from right to left and neared the pale white edge of the ice sheet. Through my camera’s zoom, I could see a furry brown head and small hump of a back. To my surprise, instead of diving down under the ice and disappearing, it climbed up onto the precarious, perforated margin, fully revealing its plump, brown body. Well, this was just a pit stop apparently, because it spun right around and slipped back into the water, its dark, rope-like tail following closely. Well, that answers that question. Although beavers and muskrats are both furry, brown, aquatic rodents, their tails offer instant differentiation even when a size comparison is difficult. Beavers, of course, have those flat, paddle-like tails, while muskrats’ tails are long, skinny, and slightly taller than wide. 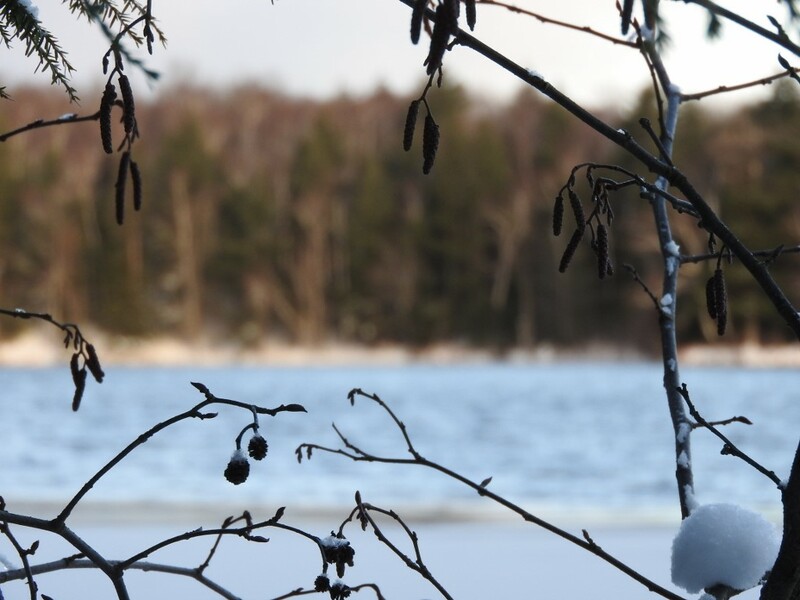 Muskrats are active year-round, even in the frozen north. While that thought sends a shiver down my spine (I may do a polar plunge, but I’m not going to swim laps under the ice! ), muskrats are as well-adapted to their particular lifestyle as anything in nature. Plus, while we endure -40-degree wind chills, their watery world stays above 32 degrees. A warm coat is their first line of defense against the cold, and to be warm, it must also be dry. Dense underfur traps air and keeps moisture away from their skin while also adding buoyancy. Of course, their soft, warm pelts are also a liability, since humans want a piece of that cozy warmth. 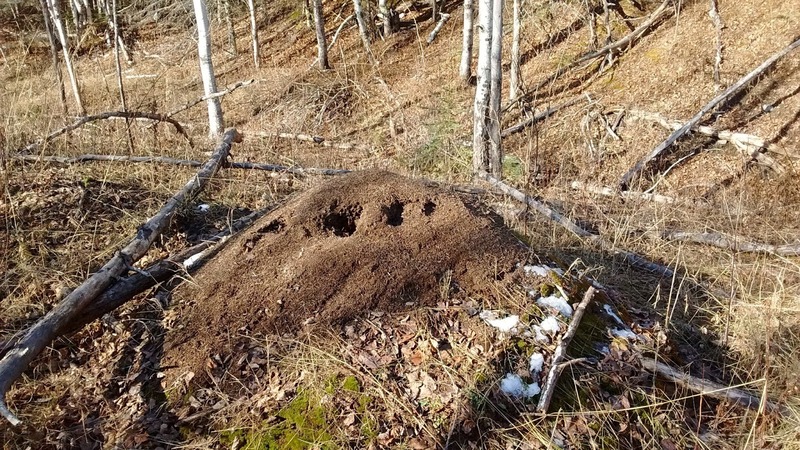 The early 1900s were the height of fur trapping for muskrats, but it’s a tradition that continues today. In fact, my first, rather memorable encounter with a muskrat was to watch my older brother peel the skin off one as it hung from our basement rafters. He sold the furs for a little money, but I think that his true motivation was an excuse to tramp around outdoors. He’s passing on his skills, now, to my middle nephew. Derek is trapping muskrats out of the landscaped pond in a neighboring suburban development. In exchange, the association will let him bike over and go fishing whenever he wants. When you’re 13, that’s a pretty good deal. I’ve often puzzled over the continued demand for muskrat fur, even though at $3 per pelt, the demand doesn’t seem very high. At some point, a warm jacket made of anything would be welcome—and they are so soft—but a musky-old-rat stole just doesn’t have the same cachet as mink. To get around this, old-time furriers had the pelts specially trimmed and dyed, after which this rodent’s fur was sold as “Hudson seal.” It was so popular that muskrats were introduced as a fur resource into Japan, Scandinavia, and Russia, and then spread throughout northern Europe and Asia. Warm fur isn’t enough to keep muskrats going all winter long, though. As with any animal that stays active through the cold months, the ability to find food to fuel their metabolism is crucial. Unlike beavers, muskrats don’t store food. Instead, they continue to forage for vegetation under the ice. When the water is shallow or the ice is especially thick, muskrats may even dig channels in the mud to help them get around. Food, in their case, is mostly the leaves, stems, and roots of aquatic plants like cattails, rushes, sedges, water lilies, and arrowheads. Bacteria in muskrats’ guts ferment this high-fiber diet and make more nutrients available. While a partnership with bacteria isn’t unique in itself, the fact that muskrats can vary their diet to include significant amounts of meat in the form of frogs, fish, turtles, and crayfish without killing off their fiber-digesting bacteria is unique. It’s no wonder that these omnivores are such opportunists—they need to eat 25-30% of their weight in food every day! Even with the consumption of that much food, getting enough nitrogen is a challenge once the most nutritious plants die back and animals go into hiding. Muskrats deal with this shortage by reducing the amount of nitrogen they excrete and increasing the surface area in their gut available for absorption. The surface area of ice on the lakes expands for winter, too, and in fact, most have already frozen up since that calm, gray day. Like the sleek muskrat slipping out of sight, that one moment of beauty is gone. Such endless moments of beauty drift around us every day, and we can choose to appreciate them promptly or not at all. Which will you do?